Are you an eCommerce business struggling to increase sales or capture leads? In this case study, we’ll learn how Cosmetic Capital gains 770 leads every week using OptinMonster’s Floating Bar feature. Cosmetic Capital is an eCommerce website specializing in affordable, trendy cosmetics from around the globe. Located in Sydney, Australia, Cosmetic Capital stocks over 3500 beauty items with a focus on providing great quality, service, and pricing to customers. When we started using OptinMonster, we were looking for a solution that would offer us customizable popups to increase our database. We knew that database acquisition was crucial for our business, and after limited success with a competitor, we were drawn to OptinMonster’s well-reknown platform to design really impressive popups. At first, Cosmetic Capital tried out several popup options. These popups focused on list building and reducing abandonment. Their first Lightbox popup saw a respectable 7-8% conversion rate. In late 2017, Cosmetic Capital changed tactics. They added a Floating Bar campaign, detailing an offer (e.g. free mascara with your Maybelline product purchase today). Again, this campaign brought good conversion rates. But, they needed greater conversions for quick, scalable growth. Included a sign-up form alongside the timer. Make the visitor curious to sign-up for an exclusive offer. Overnight, Cosmetic Capital saw a 300% increase in leads daily. In total, they’ve captured more than 18,000 leads. That’s 600 new leads each week! 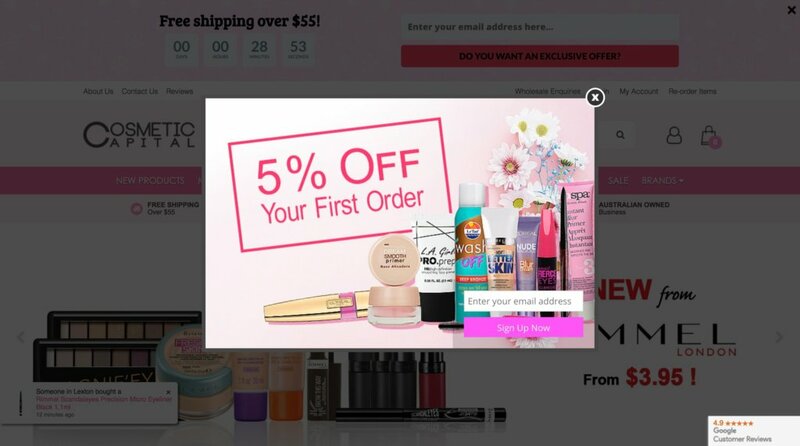 They also use a Lightbox popup to show a 5% discount offer. This brings an additional 170 leads per week. Take a look at more Floating Bar hacks to boost conversions without annoying visitors. Cosmetic Capital controls the customer journey from start to finish. On average the leads they gain using OptinMonster perform better than leads captured through other mediums. Cosmetic Capital used OptinMonster to capture leads and drive sales. Cosmetic Capital gains 770 new leads each week using OptinMonster. Scarcity: Let your visitors know that your offer is limited, typically by quantity. Curiosity: Peak the visitor’s interest by hinting at a revelation or transformation. Cosmetic Capital used urgency and curiosity by showing a limited-time offer to their website visitors alongside a surprise offer in their Floating Bar campaign. Both urgency and curiosity tactics are highly effective in eCommerce lead generation. OptinMonster is a simple to use – yet powerfully effective – tool that will change your eCommerce store overnight. The range of options allows you to find the perfect popup for your site, whether you want to increase your list size, reduce abandonment or trial new features. We can’t recommend it highly enough.